In our commitment to provide you with products that complement your timeless and ageless beauty, we present to you 5 moisturizers that contain retinol that help defy the signs of aging. After testing these products out and hours of in-depth research, we picked what we feel is the best moisturizer with Retin A based on anti-aging benefits, overall feel on the skin and price. A 71% organic product, the Miracle Retinol Moisturizer by Radha Beauty combats the signs of aging while moisturizing the skin. It comes in a pot container and is fragrance-free. Lightweight, the Retinol Night Cream Moisturizer by Clia firms the skin by repairing past damage and boosting collagen production. It also has green tea for added antioxidant protection. The Advanced Anti-Aging Retinol Cream by Geneva Naturals boasts of containing Edelweiss, a powerful plant that fights the signs of aging. It comes in a convenient and hygienic pump bottle. Neutrogena’s Rapid Wrinkle Repair Regenerating Cream promises to reveal a more youthful looking skin in just a week. It is great for all skin tones and gentle enough for everyday use. 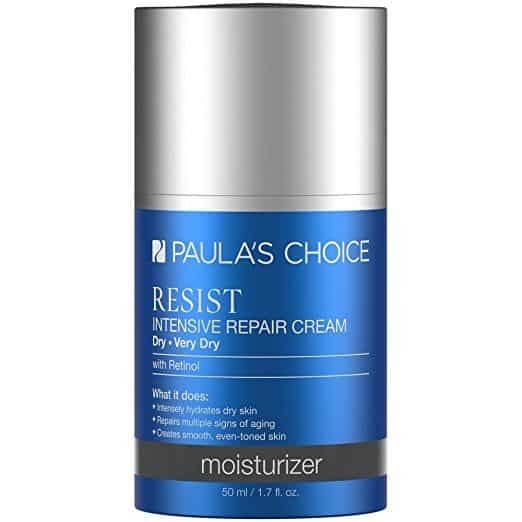 Great for dry skin, the Resist Intensive Repair Cream by Paula’s Choice has a creamy texture to leave skin moisturized when you wake up. It also comes in a pump bottle and is fragrance-free. A 71% organic product, this best moisturizer with Retin A has 2.5% Retinol to help reduce fine lines and treat hyperpigmentation. It also contains moisturizers to keep skin deeply hydrated. Retinol helps boost collagen production and softens fine lines and wrinkles for smoother, more radiant skin. It also minimizes the appearance of pores for an even and flawless complexion. This cream is also infused with moisturizers like Shea Butter, Jojoba Oil, Green Tea, Aloe Vera, and Vitamin E. These maintain your skin’s suppleness as Retinol, on its own, can be drying. Lightweight, this cream is easily absorbed by the skin and doesn’t leave an oily feel. It does not clog the pores so it won’t cause breakouts and can even prevent future ones from happening. It is also free of any fragrances making it ideal for those with sensitive noses. It is packaged in a convenient, hygienic pump bottle and best of all, the company offers a money back guarantee. Recommended by dermatologists, this moisturizer diminishes the appearance of pores and fine lines for radiant skin. It comes in a huge container so you really get your money’s worth. This cream helps boost the production of collagen and softens wrinkles for smoother and more even skin. It also has Aloe, Shea Butter, Jojoba Oil, and Vitamin E to moisturize the skin. It also contains green tea extracts that fight against free radicals. Its medium consistency is easily absorbed by the skin so you won’t feel greasy throughout the day. It does smell a bit so if you are sensitive to smell, this is something you’ll want to consider. We also like that it delivers fast results and can be used on any part of the body needing extra moisturization. It is scientifically formulated so it’s less likely to cause allergic reactions, too. It’s comparable to more expensive brands and it delivers the same, if not better, results. We just want to warn you that it might sting upon application but rest assured it’ll quickly go away. Approved by top Swiss dermatologists, this cream promises to turn back the hands of time by boosting collagen production to soften fine lines. It comes in a pump bottle for easy dispensing. Aside from retinol, its main ingredient includes Edelweiss Extract. This plant has a high level of UV protection and is highly antimicrobial, thanks to its Leontopodic Acids A and B contents. This cream also contains Hyaluronic Acid which is known for its ability to retain moisture. It also has Vitamin E, Moringa, and Coconut Oils to moisturize the skin and prevent it from drying out. Free of parabens, this cream is lightweight and is easily absorbed by the skin without leaving a greasy residue. It does not contain any fragrance, making it ideal for those with sensitive noses. It reduces pore size, helps with hormonal acne, and can even help lighten acne scars. It calms down any redness and irritation and as one reviewer said, has helped with her keratosis pilaris. This anti-aging face cream promises to offer visible results in as early as one week. It is safe enough to be used every day, ideal for all skin tones, and comes in a pot container. It is infused with Retinol SA that lightens spots and smoothen fine lines and wrinkles. It also has Glucose Complex that acts as a Retinol SA booster as well as Hyaluronic Acid to hydrate skin. This product is creamy and is easily absorbed by the skin so you won’t feel uncomfortable. You will experience a bit of stinging and flaking on the first week but those are all part of the process. Skin will really look (and feel) firmer and more toned after continued use of this cream. Laugh lines and crow’s feet will disappear and you’ll be restored to your youthful beauty in no time. It is comparable to high-end brands and will make you look as if you had Botox. One complaint, though, is it has fragrance but luckily it quickly goes away once the product is fully absorbed. Great for dry skin, this Retin A moisturizer deeply moisturizes the skin while fighting the signs of aging for a more youthful, healthier glow. It comes in an elegant-looking pump bottle. It is packed with antioxidants that help tone the skin. It is also infused with Vitamin C, peptides, and niacinamide to help with sun damage, along with other ingredients to make skin more supple. This cream is slightly thick but is quickly absorbed by the skin so you won’t feel sticky. You may also break out during the first week of use but that’s normal and a sign that your skin’s adjusting. It deeply moisturizes the skin without causing clogged pores so it’s great for acne-prone skin, too. It also doesn’t cause any redness and irritation making it perfect for sensitive skin as well. It doesn’t have any smell which is a plus. We only dislike that the bottle is too opaque you can’t see how much product you have left and that you can’t unscrew the pump from the bottle itself. Retinol creams are a popular choice to fight acne, as shown on this list of the best retinol creams for acne prone skin. However, they can also be used for wrinkles and that’s what we’re going to focus on today. Among the many types of retinoids, tretinoin was the first FDA-approved kind to fight against wrinkles. It increases collagen production and stimulates blood cells for a youthful appearance. It can also help reduce the appearance of dark spots and may also help against the damages of ultraviolet radiation. Though OTC retinoids aren’t as effective as tretinoin in minimizing the appearance of wrinkles, they can help enhance sun-damaged skin. Along with AHAs, it can even help soften the skin. When using retinoids, it is best to use them at least two times a week on your chest, neck, and face. Don’t forget your hands and forearms as well. It may take at least 3 to 6 months before visible improvements can be noticed. On the other hand, it would take 6 to 12 months to see best results. Don’t forget to apply one of these best sunscreens that have at least an SPF level of 30. Wear protective clothing such as a hat, a pair of pants, and long sleeves. Retinol creams are perhaps the most convenient way for us to fight the signs of aging. But with a lot of creams out in the market today, how do you know which one is really worth the money? Fortunately, we’ve done all the work for you so you don’t have to worry about it anymore. We chose the Miracle Retinol Moisturizer by Radha Beauty as the best moisturizer with Retin A. It fights the signs of aging while leaving skin soft and hydrated to restore your youthful glow. It contains 2.5% Retinol to boost cell turnover and the production of collagen. It is also rich in Shea Butter, Jojoba Oil, and Vitamin E to maintain the skin’s softness and suppleness. This cream is ideal for all skin types and even offers a money back guarantee. It is just a bit pricey, but we guarantee you’ll be pleased with the results.